Calling all cookie lovers! These gluten free and vegan cookies are extremely delicious and rich in fiber, protein, and low in sugar, making them nutrient dense. We’ve sweetened these cookies with only whole food sweeteners, maple syrup and blackstrap molasses, and a little bit of dark chocolate and cacao nibs make them extra delicious. There is a quarter cup of both ground flax and hemp seeds in the recipe. Ground flax is high in omega 3 fatty acids, protein, and fiber (which will keep you feeling full for longer). A cookie that keeps you full and is guilt free!?! Hemp seeds are rich in two essential fatty acids called linoleic acid ( this is an omega 6) and alpha linoleic acid (this is an omega 3). These essential fatty acids can support the body’s immune response and help with reducing inflammation, which can potentially help with inflammatory conditions like eczema. Hemp seeds are also a great source of vitamin E, iron, magnesium, calcium and 25% of their calories come specifically from protein. 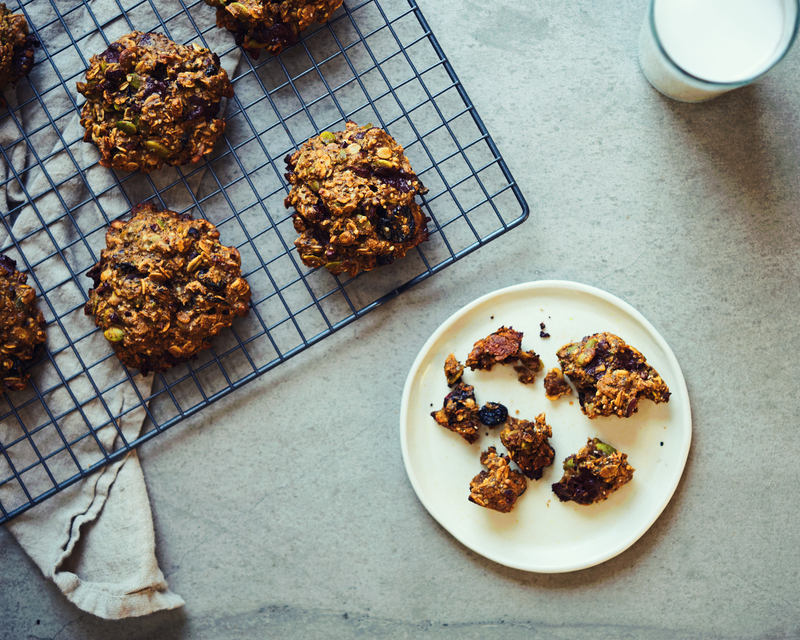 We used ¼ cup of hemp seeds in these cookies, which means there are 22 grams of protein in them. Hemp seeds contain all essential amino acids and are therefore considered a “complete” protein. This is very rare for plant based foods as many of them (besides hemp seeds and quinoa) lack all of the essential amino acids. The next important ingredient in this recipe is pumpkin seeds. They add a little crunch and a large amount of nutrients to the cookies. There is 1 cup of pumpkin seeds per batch. Pumpkin seeds are full of essential nutrients and minerals including iron, zinc, and magnesium. Consuming foods such as pumpkin seeds that are high in the antioxidant vitamin E can reduce inflammation and help protect your cells. Studies have shown that eating pumpkin seeds can lead to cancer prevention for breast and prostate cancer. Pumpkin seeds are a great source of magnesium, which is essential for so many processes in the body including your heart health, muscle relaxation and good sleep. Most importantly, they are very easy to add to your diet. Pumpkin seeds can be eaten on top of salads, in granola, or even in delicious desserts like these cookies. Check out the recipe below we hope you enjoy them! Mix dry ingredients in one bowl and the wet ingredients in another. Add wet ingredients to the dry ingredients and stir to fold together. Fold in the chopped chocolate, cacoa nibs and dried cherries. Line 2 big baking sheets with parchment paper. Use a ⅓ measuring cup to scoop the dough and flatten it until it is approximately an inch thick. Bake cookies for 25-35 minutes or until lightly browned. Cool and then store in fridge.